Constellation Brands, Heineken and now possibly Coca-Cola are pushing interest in cannabis to new heights with extraordinary implications for the future of the beverage industry. 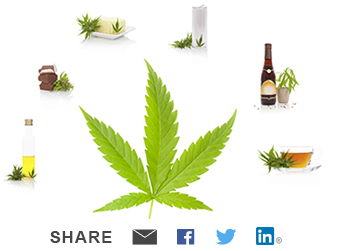 As we wrote back in May in our article Cannabis is Growing Like a Weed, driven by the growing acceptance of cannabis consumption, we expected the growth of cannabis-infused food and beverage to be a slow but strong burn over many years. However, the market is changing rapidly right in front of us, more quickly than we imagined even four months ago. The big alcohol companies need to respond defensively to legal marijuana and the soft drink companies need new areas of growth and several of the big global beverage companies have thrown their hat in the cannabis ring this summer in response. Per our report, The Cannabis Revolution: How Cannabis is Disrupting the Food and Beverage Industry, the cannabis industry is currently projected to rise to an estimated $10 billion at retail in 2018 and we have the industry growing to $24 billion by 2025. Judging by the amount of activity in the space, these are likely conservative estimates and cannabis in food and beverage in particular has a long runway ahead. Consider the high profile cannabis news from just this summer. In June, Heineken announced that it would become the first big brewer to sell a THC-infused cannabis beverage though its Lagunitas brand, launched as a new sparkling water line in California. In August, beer and spirits giant Constellation Brands jumped in with two feet and a $4 billion investment in a five-year old publically traded Canadian cannabis company called Canopy Growth. Constellation's multi-billion bet is the largest investment in cannabis to date and although Constellation has no plans to sell a cannabis beverage before a national legalization in the US, it may launch one in Canada, perhaps as early as next year. MolsonCoors and Diageo are in the mix as well, looking at the Canadian market as a starting point. The truly big news is that Coca-Cola is now looking. Bloomberg reported in September that Coke is in talks with Canadian marijuana producer Aurora Cannabis to develop CBD-based beverages. Coke acknowledged the interest but was publically non-committal about its intent with Aurora. However, even if Coke walks away, Coke's probably genuine interest means we may have reached an inflection point in the commercial reality of cannabis: every big company will eventually need a cannabis strategy. If Coke does follow through on CBD beverages, everyone else will have to follow Coke's lead. Our current line-up of BMC reports are on point for thinking about the future of cannabis. We've taken a deep dive into current and future trends with a great line of current reports, analyzing the cannabis industry from all angles. The Cannabis Revolution: How Cannabis is Disrupting the Food and Beverage Industry takes a broad view of innovation opportunities inside the larger cannabis industry, specifically as it relates to food and beverage companies. We are indeed bullish, especially on CBD, the anti-inflammatory chemical which is useful as a relaxant and anti-oxidant. We followed up quickly with two reports later in the year which expanded on these ideas. Supply Chain Symbiosis: Why the Beverage Industry and Blockchain are the Missing Link in the Cannabis Revolution was published in June. In that report, we acknowledged that the cannabis industry will face many of the same supply chain challenges as industries like food and beverage but many best practices will also crossover, opening the door for the beverage industry to stake a claim in the cannabis industry and redefine its own future and legacy. We also argued that Blockchain is a highly valuable system for cannabis-related transactions due to restrictions on national and regional banks holding on to cannabis-derived money. Finally, in July, we published Cannabis is the New Alcohol: Reinventing Cannabis for Sustainable Mainstream Use which postulated that the beverage industry is uniquely positioned to capitalize on this growing market because the "new" cannabis consumer is the "old" alcohol consumer. Per our report, in a 10,000 person survey of California users conducted by Eaze (prerecreational legalization), the single most uniting sentiment amongst those polled was a common desire to reduce or replace alcohol and pharmaceutical consumption to find natural relief and enjoyment from cannabis. That should make every company selling beverage alcohol sit up and take notice. As we said, everyone will need a cannabis strategy sooner rather than later.